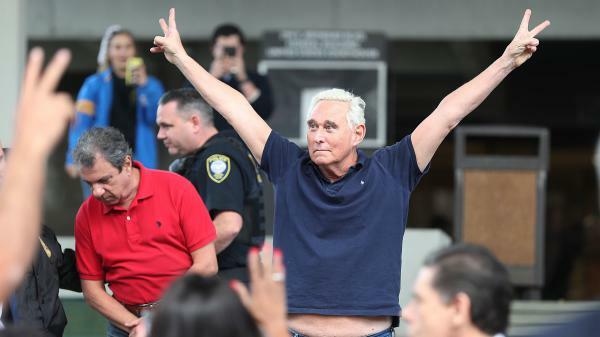 Roger Stone exits the federal courthouse Friday in Fort Lauderdale, Fla.
Stone's next court appearance is scheduled to be in Washington on Tuesday. 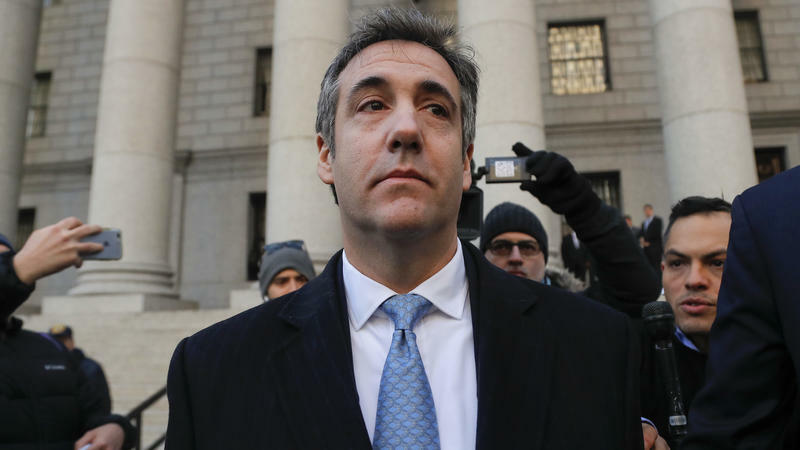 He told reporters outside the courthouse in South Florida that he plans to plead not guilty and that he looked forward to "being fully and completely vindicated." The indictment, returned by a grand jury impaneled by Justice Department special counsel Robert Mueller, is the first to charge an American in connection with one of the best-known aspects of Russia's attack on the 2016 election: the theft and release of emails that embarrassed political targets including significant figures in the Democratic Party. In the indictment, the special counsel's office alleges that Stone was in regular contact both with WikiLeaks, listed as "Organization 1," and the Trump campaign during critical times around the release of emails stolen from the Democratic National Committee and a top Clinton campaign official. "After the July 22, 2016 release of stolen DNC emails by Organization 1, a senior Trump Campaign official was directed to contact Stone about any additional releases and what other damaging information Organization 1 had regarding the Clinton Campaign," the indictment says. "Stone thereafter told the Trump Campaign about potential future releases of damaging material by Organization 1," the indictment also says. In other words: The Trump team asked Stone to find out more from Wikileaks. Stone then told the Trump campaign that WikiLeaks had more ammunition for use against Democrats, prosecutors allege. On Oct. 4, 2016, WikiLeaks was set to make a major announcement that wound up being a bust. The indictment describes people connected with the Trump campaign — including a senior official — reaching out to Stone to ask what happened. Stone reassured them that WikiLeaks would come through and that the material it released next would be damaging to Hillary Clinton, prosecutors write. Three days later, as the Trump campaign was dealing with the fallout from the crude Access Hollywood tape, WikiLeaks released the first of Clinton campaign chairman John Podesta's emails. "On or about October 7, 2016, Organization 1 released the first set of emails stolen from the Clinton campaign chairman. Shortly after Organization 1's release, an associate of the high-ranking Trump campaign official sent a text message to Stone that read 'well done,' " the indictment says. Continued prosecutors: "In subsequent conversations with senior Trump Campaign officials, Stone claimed credit for having correctly predicted the October 7, 2016 release." The information in the indictment suggests that Trump's campaign was communicating, through Stone and his associates, with the outlet chosen by Russia's military intelligence agency, the GRU, as the platform through which it was releasing embarrassing material stolen in cyberattacks. A Trump lawyer said on Friday that the charges in the Stone indictment, however, aren't about collusion — they're about the statements Stone made to Congress and others. "The indictment today does not allege Russian collusion by Roger Stone or anyone else," said Trump personal attorney Jay Sekulow. "Rather, the indictment focuses on alleged false statements Mr. Stone made to Congress." The dawn military-style arrest of Mr. Stone, a 66 year old political consultant, was wholly unnecessary and served no purpose other than intimidation. The charges against Mr. Stone do not allege that Mr. Stone lied about his contacts with Julian Assange, but rather about his contacts with others and about documents reflecting those communications. The [office of special counsel Robert Mueller] has never spoken with Mr. Assange. It remains unknown what criminal charges have been brought against Mr. Assange in the Eastern District of Virginia. The government continues to refuse to explain to Mr. Assange or the public the nature of those charges. Pollock's statement alluded to suggestions that have appeared in court documents that there may be a sealed case against Assange. And prior to his arrest and indictment this week, Stone has repeatedly denied that he conspired with the Russians who attacked the 2016 election. White House press secretary Sarah Sanders attempted to distance the president from the indictment and arrest. "The president did nothing wrong," Sanders said in a Friday morning interview on CNN. "There was no collusion." She didn't respond directly when asked whether Trump had told campaign aides to contact Stone about the hacked emails. Trump himself has hailed Stone in the past for vowing to protect Trump if he was ever arrested. Stone has been a political operator for decades; he has a tattoo of Richard Nixon's face on his back. 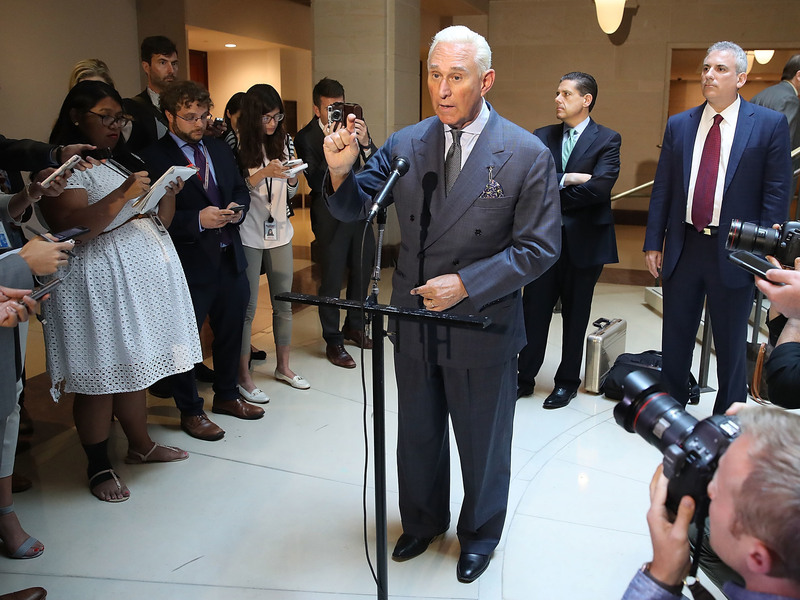 Republican political operative Roger Stone, seen here in a photo from 2017, was charged in connection with the Russian attack on the 2016 election. At one time, he was in business with another important Trump World figure, onetime 2016 campaign chairman Paul Manafort, who has since become a cooperating witness in Mueller's Russia probe following a conviction in one federal case and a guilty plea in a second. Prosecutors, however, want a judge to void Manafort's plea agreement because they say he has been lying to them. Manafort has a sealed court hearing scheduled on Feb. 4 about that issue. Stone has cultivated an image as a "dirty trickster" and sought attention in the press, a Netflix documentary and a book that lays out his "rules" of operation in the politics game. Stone was not a formal member of Trump's campaign in 2016, but he spoke often by phone with the then-candidate and other people in Trump's inner circle. In May 2018, he told NPR that he did not conspire with the Russians who attacked the 2016 election and that he felt he ultimately had nothing to fear from the special counsel. But he also said he expected to be indicted. "They're following a fake news narrative, which continues to repeat incorrectly that I had advance knowledge of the content source or exact timing of the WikiLeaks disclosures," Stone told NPR at the time. 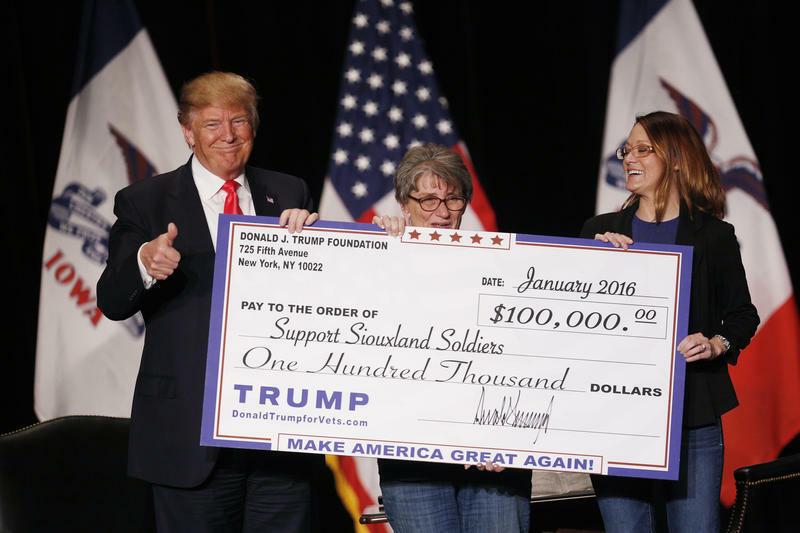 "If you read that enough times in the media, you might begin to believe it. Unfortunately, there is no evidence or proof that that is the case because it is false," he also said. What Stone says now is that he's the victim of his own hype: He tried to make himself appear to Trump's campaign in 2016 that he had an inside connection to WikiLeaks, but he actually didn't. Yes, Stone says, he did email Trump's then-campaign head, Steve Bannon, and talk about WikiLeaks' plan to help the Trump campaign. But Stone says he wasn't serving as a real interlocutor between Trump World and WikiLeaks boss Julian Assange. He was just posing, he claims, based on what he had seen Assange say in interviews or the press: "What I am guilty of is using publicly available information and a solid tip to bluff, posture, hype and punk Democrats on Twitter," Stone wrote in November 2018. "This is called 'politics.' It's not illegal." Stone drew a lot of public attention as the Russian active measures against the 2016 election were coming into focus but before so much information about them had been established publicly. According to The Wall Street Journal, Stone said in a conference call in early August 2016 that Assange would continue to release politically damaging material to hurt Hillary Clinton — material that originated with Russia's military intelligence agency, the GRU. Mueller's office detailed the alleged interaction between the GRU and Assange in a July 2018 indictment. The Russian intelligence offers also allegedly gave Assange emails stolen from the Democratic National Committee. Stone also wrote on Twitter on Aug. 21, 2016, that Clinton's campaign chairman, John Podesta, would soon have "his time in the barrel;" later WikiLeaks embarrassed Podesta by releasing his emails. Stone has said his tweet wasn't a reference to the emails. Since then, however, court documents released in connection with the special counsel investigation have suggested there were a number of direct messages between Stone and an online persona used by the Russian military intelligence officers who launched the cyberattacks. The office of special counsel Robert Mueller made a rare statement on Friday night to dispute the report by BuzzFeed News that President Trump had instructed his former lawyer to lie to Congress. The Justice Department announcement appeared not quite 24 hours after the explosive story from Thursday night. Although it didn't go into detail, the response suggested the story didn't correctly reflect the special counsel's dealings with Trump's ex-fixer. There have been so many big developments this week in the Russia story that it's tough to keep them all straight. What happened? 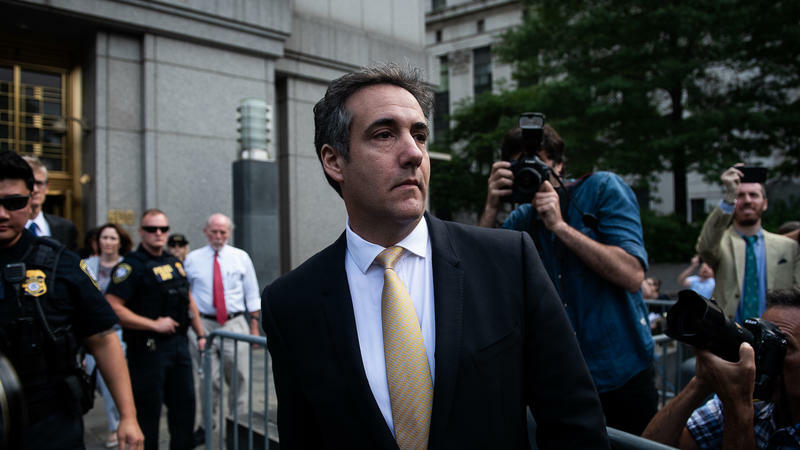 Donald Trump's former longtime lawyer Michael Cohen admitted on Thursday that he and others working for Trump negotiated with important Russians over a possible Trump Tower in Moscow well into the presidential campaign in 2016.